It’s not good enough that LeBron James has to be a great basketball player; he also has to be in the movie business. After getting a taste of life on the big screen in 2015’s Trainwreck, James’ production company, SpringHill Entertainment, has acquired the rights to an Elite Draft video in which writer Connor Toole attends the 2015 NBA Drafts in New York and pretends to be the latest pick of the Utah Jazz. Toole, who is 6’10 (and maybe should have considered a career in basketball), was able to fool everyone he meets into giving him free drinks and women’s phone numbers. According to Deadline, the film will be a comedy, but there’s very little other information. 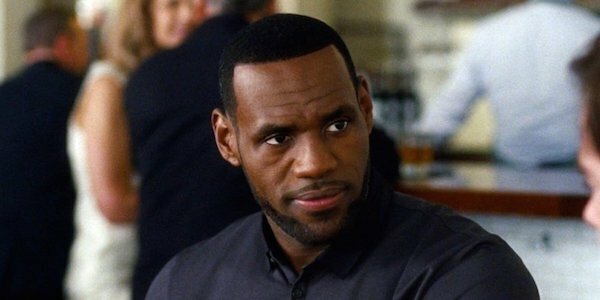 There is no word on a writer or director, yet but it’s safe to assume that LeBron James will appear in some form, possibly in a supporting role, playing himself. This is exactly what his role in Trainwreck was, but why mess with a good formula? James was one of the biggest surprises in that movie. The NBA player displayed some pretty surprising comedy chops, keeping up with people who are funny for a living like Amy Schumer and Bill Hader. Based on the Elite Draft video, we can guess that the film version will have the similar plot of a tall man pretending to be drafted and then soaking up the crazy amount of attention he receives from drunken people. You woudn’t think a two minute video could inspire enough content for a movie, but there’s clearly room for a decent comedy in this source material, and it’s easy to see how the video can be translated onto the big screen. There’s some actual meat on this bone. A highlight of the video is how much attention players get and how they basically get whatever they want. It could be a nice look into how we treat our sports stars and what it’s like to go from zero to hero overnight. Then again, it could also easily transform into a two hour showcase of debauchery and crazy antics with little of anything else, like actual jokes. There have been plenty draft and recruitment movies about football and baseball, but not a whole lot of basketball. It might be cool to see a basketball draft movie made by a guy who’s actually been through it. It’s exciting to see LeBron James stretching his very long legs, but where the hell is that Space Jam sequel he was rumored to be making? You can’t just dangle a golden carrot like that and take it away! I loved Space Jam as a kid, so I’ll be holding my breath and crossing my fingers until I see the Tune Squad hit the courts again.